Avoid using chlorine bleach or any other chlorine-based mildew cleaner. To clean mildew, you'll need some distilled white vinegar (which you can get from Amazon), an empty spray bottle, baking soda, gloves, and an aggressively abrasive sponge. Fill the empty spray bottle with the white vinegar and don't dilute. When the vinegar has had time to set, dampen your scrubbing sponge with hot water and load it with baking soda. While you're at it, you may as well clean the area of dirt and soap scum. A botanist will tell you that “mildew” is mold that grows on plants, and they’d be right; however, the word has been hijacked by bathrooms, window sills, basements, and other areas that have a hard time staying dry. You’ve probably seen mildew in overcrowded gardens. There isn’t enough air flow and the sun doesn’t reach everything, and the continuous moisture causes mold to develop. And so it makes sense the word “mildew” is now synonymous with bathrooms, which are unavoidably exposed to sustained moisture. What is the difference between mold and mildew? Nothing. Mold is just called mildew depending on where in your house it is found. You’ll notice that mildew odor has that same pungent, musty flavor as the “mold” found elsewhere in your home. Mildew removal is important because of the damage it can do to you and your home. Mildew stains surfaces and over time weakens (eats) structures. 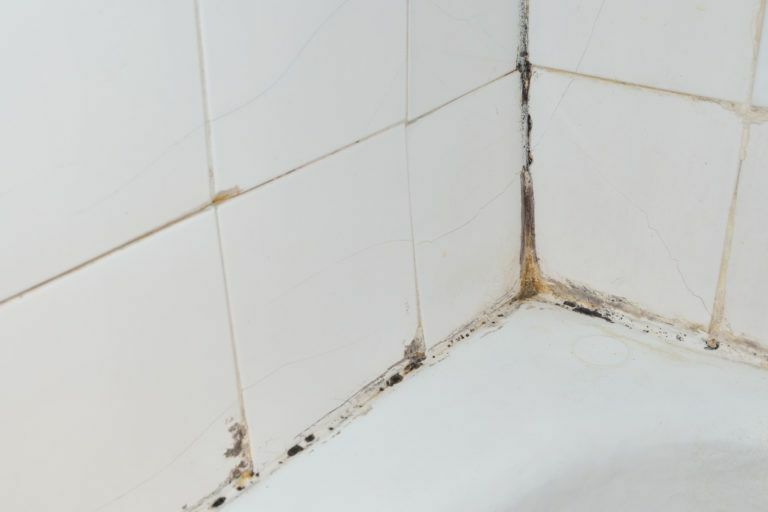 Research is ongoing as to how mold affects people beyond allergies, but some molds that produce “mycotoxins” allegedly can cause respiratory problems and may be carcinogenic. Below you can learn how to clean mildew without bringing apocalyptic chemicals into your home. Avoid using chlorine bleach or any other chlorine-based mildew cleaner. Do you want to kill yourself, or do you want to kill mildew? 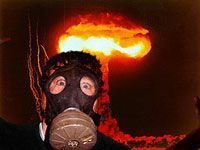 I would rather expose myself to hairy loaves of mold than any kind of commercial pestilence. Here at “How to Clean Things” we only exercise the nuclear option when absolutely necessary, and for cleaning mildew it should never come to this. If you have a mildew problem bigger than ten square feet, you’ll want to call in a professional. To clean mildew, you’ll need some distilled white vinegar (which you can get from Amazon), an empty spray bottle, baking soda, gloves, and an aggressively abrasive sponge. Vinegar will kill mildew, germs and bacteria and is extremely cheap. 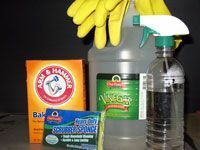 Cleaning mildew with vinegar will also do away with that nasty mildew odor. The baking soda and sponges help remove mildew stains. Lastly, you’ll need a mask. An N-95 – which is sold at any hardware store – will suffice. 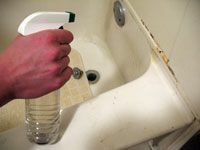 Fill the empty spray bottle with the white vinegar and don’t dilute. 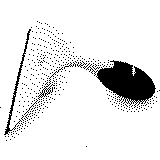 Liberally spray all the affected areas and be sure to make either laser or blasting sound effects as you do it. Mildew is easily intimidated and confused. After spraying the mildew, let it sit for a couple of hours to allow the vinegar to penetrate and kill the mildew in cold blood. When the vinegar has had time to set, dampen your scrubbing sponge with hot water and load it with baking soda. I give the mildew one last taste of vinegar, and then scrub away. The most important mildew-cleaning ingredient here is of course elbow grease. 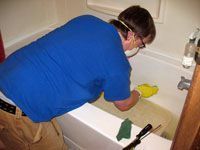 My tub was in a truly derelict condition before I started, with mildew from ceiling to basin, so the job wasn’t easy, but exertion is the only way to clean mildew stains. While you’re at it, you may as well clean the area of dirt and soap scum. 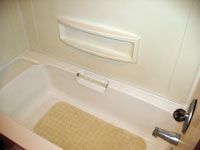 Vinegar and baking soda is the way to go even if you’re not trying to clean mildew, but just everyday, ordinary filth. Behold. My bathroom was a disgusting place to try to get clean, and now it stands as an ivory testament to my industry. The picture speaks for itself. Now that you’ve learned how to clean mildew with safe, biodegradable cleaners, will you ever go back to bleach? No, I’m not talking about an STD. The trouble with bathroom mildew is that if the problem has been left unchecked on caulking for some time, you’ll just have to remove the caulking completely. It will be impossible to clean and it will deteriorate and break apart, letting moisture into the walls. Though it’s an added hassle in the fight to clean mildew, it isn’t hard. You’ll need a mask and gloves, and some vinegar wouldn’t hurt. Spray the caulking with vinegar as usual and scrape it away with a flat-head screwdriver. Rather than let the caulk chunks (also not related to STDs) float down the drain, I tossed them in a garbage bag and sealed it when I was finished. 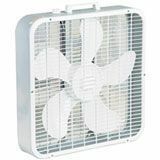 Let the tub sit for a day or so to dry completely – a fan may help with this. Don’t wait too long to apply some fresh caulking, however, as without the barrier you’ll end up with moisture and then mold in your walls. 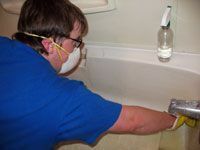 If you want to learn more about mold and mildew removal, I’ve written another page on the topic. With bathroom mildew, a lazy or clogged exhaust fan is usually the culprit. You should always run your exhaust fan during and after a shower, but one could run ours forever with little effect. Getting the vent fixed is high on our priority list, but until we can, running a box fan will keep the moisture from getting out of control. Left without good circulation, the mildew will quickly return. 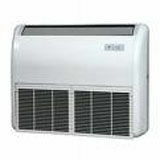 Running an air conditioner and/or a dehumidifier is a great way to prevent mold and mildew. Keeping your home at a reasonable humidity level will go a long way in preventing mold and mildew. The EPA advises people to strive for 30 – 50 percent relative humidity. Be sure to clean your dehumidifier, or it will become a great target for mold growth. If you want to monitor the relative humidity in your home, purchase a quality hygrometer. Go get yourself a quality shower squeegee to combat bathroom mildew. Using a squeegee on linoleum or tile is a great way to reduce standing moisture. It’s quick, somewhat fun, and the handle doubles as a microphone, if you’re into that. Shower sprays have come into vogue, but filling a spray bottle with vinegar is a better idea, and it’s much cheaper.